There are two Kremlin top officials, who appear frequently on a state-controlled television and seem to compete for Russia’s presidency. And so they may be. But at least one prominent analyst predicts the pair will split the current presidential powers between them when Putin leaves office next year, with one serving in a weakened presidency and the other becoming a stronger prime minister. Other experts suggest Putin late this year will throw the weight of the Kremlin behind a surprise candidate, who might step down in a year or two and clear a path for Putin to run again. Putin's popularity is so high that whomever he endorses is almost certain to win. Dmitry Trenin, an analyst with the Moscow Carnegie Center, regards the matchup between Ivanov and Medvedev as a dress rehearsal by two leading men rather than a competition between rivals. Trenin says Putin is likely to endorse Ivanov, but he also predicts Putin would install Medvedev as prime minister, and expand that position's powers in relation to the president's. One way to do that, Trenin said, would be to name a cabinet loyal to Medvedev - and Putin - before Ivanov took power. "Without changing one iota of the constitution, we'll have a new constitution in Russia," Trenin told The Associated Press. "All power in the Russian Federation is now vested in the president of the Russian Federation. That will be modified." Trenin and other analysts say Putin hopes to retain influence, perhaps even continue to run Russia, in retirement. "I think he will find the kind of formula in which he would step down, but stay on," Sergei Stepashin the head of the Russian Audit Chamber, was quoted as saying by the newspaper Komsomolskaya Pravda. "He is going to leave in order to stay," said Nina Khrushcheva, an analyst at the World Policy Institute of New York City's New School. "President Putin himself will be on the chessboard, we don't know in what capacity, but it's very clear that he will be in a powerful position," Trenin said. Russian voters are prepared, he said, to ratify Putin's choice of the new leadership. They have even reconciled themselves to a certain level of corruption among top officials, as long as they feel they are being competently led. "Russia is an autocracy or an authoritarian state today with the consent of the governed," he said. On television news programs, both Ivanov and Medvedev have been shown touring factories and meeting with professional groups, scolding lower-ranking officials and announcing ambitious social, military or economic programs - the kind of coverage that has helped to build Putin's prestige and popularity. But there is a division of labor between these aspiring Russian leaders. Ivanov, previously the defense minister and head of foreign intelligence, has focused on security issues and foreign affairs. Medvedev, who also is chairman of the state natural gas monopoly Gazprom, has been handing out money for social programs and has focused on economic reforms. Transferring some presidential power to the prime minister could serve several practical aims, such as reducing the president's workload. It could also help Putin maintain his political influence once he leaves the Kremlin. If he endorses a single successor with commensurate powers, Trenin argues, that person can't be counted on to remain loyal. 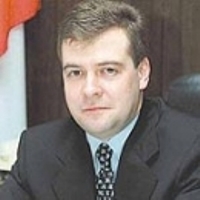 There is another potential reason for splitting power between Ivanov and Medvedev, in this view: each may appeal to separate Kremlin factions _ Medvedev to the technocrats, dedicated to executing orders efficiently; Ivanov, to the so-called "siloviki" ("powerful ones"), which includes many current and former intelligence and military officials. The siloviki are by far the larger and more important faction. They generally favor a more assertive foreign policy and expanded government control of Russia's energy wealth and other key industries. Ivanov is not considered a leader of the siloviki and may - like Putin - remain aloof from factional Kremlin politics. But judging from his comments, he appears to share many of the siloviki's views. He advocates, for example, state control of strategic industries, including energy producers and defense manufacturers. Part of his current duties include supervising the consolidation of scattered state-owned aviation, shipbuilding, shipping, space and atomic energy companies into a series of huge corporations. When it comes to foreign policy, Ivanov may be more of a hawk than Putin. And he has said repeatedly he does not think Russia needs to follow the model of what he calls"Anglo-Saxon" democracy. In a June speech to youth group leaders, Ivanov defined a democracy as a nation with the military strength to remain independent, so its people can "choose their own future themselves," the ITAR-Tass news agency reported. "Truly democratic nations are few," he said, and cited China and Russia - as well as the United States, the European Union and India - as among the world's leading democracies. Russia had to remain strong culturally, economically and politically, he was quoted as saying by TASS. "Otherwise, the Brzezinski plan may prove a reality," he said. The "Brzezinski plan" is a term used by Russian political figures since at least the mid-1980s to describe alleged Western plots to destabilize the Soviet Union and later Russia. Despite these comments, Ivanov described himself as "fairly liberal person" in a recent interview with Britain's Financial Times newspaper. Trenin said Putin may not have much faith in Russian voters, but he is a patriot who cares about Russia and the nation's continued political stability. "People may call him an autocrat, but I would consider him a responsible autocrat," Trenin said. "He clearly wants out of the Kremlin, but he doesn't want the system to crumble the minute he leaves."